In the South there is an important holy place by the name of Kolhapur, where the temple of the Lord’s divine consort Maha Lakshmi, is situated. Maha Lakshmi is continuously worshipped by all of the demigods. That place is the fulfiller of all desires. Rudragaya is also situated there. One day, one young prince arrived there. His body was the color of gold. His eyes were very beautiful. His shoulders were very strong and his chest was broad. His arms were long and strong. Immediately those demigods brought that horse before him, after which Siddha-Samadhi dismissed them. When the prince saw all these wonderful happenings, he fell at the feet of Siddha-Samadhi, and inquired from him. “How have you attained such power, which I have not seen or heard of any one else possessing? Oh great sage, kindly hear my request. Hearing those words of that great devotee, the king learnt from Siddha-Samadhi the Twelfth Chapter of Srimad Bhagavad-gita. In the course of time, both the king and his son attained the lotus-feet of Lord Krishna. Many other persons have achieved the topmost goal, devotion to Lord Krishna’s lotus-feet, by reciting the Twelfth Chapter of Srimad Bhagavad-gita daily. arjunah uvaca–Arjuna said; evam–thus; satata–always; yuktah–engaged; ye–those; bhaktah–devotees; tvam–unto You; paryupasate–properly worship; ye–those; ca–also; api–again; aksaram–beyond the senses; avyaktam–unmanifested; tesam–of them; ke–who; yoga-vit-tamah–the most perfect. Arjuna inquired: Which is considered to be more perfect, those who are properly engaged in Your devotional service, or those who worship the impersonal Brahman, the unmanifested? Krsna has now explained about the personal, the impersonal and the universal and has described all kinds of devotees and yogis. Generally, the transcendentalists can be divided into two classes. One is the impersonalist, and the other is the personalist. The personalist devotee engages himself with all energy in the service of the Supreme Lord. The impersonalist engages himself not directly in the service of Krsna but in meditation on the impersonal Brahman, the unmanifested. We find in this chapter that of the different processes for realization of the Absolute Truth, bhakti-yoga, devotional service, is the highest. If one at all desires to have the association of the Supreme Personality of Godhead, then he must take to devotional service. Those who worship the Supreme Lord directly by devotional service are called personalists. Those who engage themselves in meditation on the impersonal Brahman are called impersonalists. Arjuna is here questioning which position is better. There are different ways to realize the Absolute Truth, but Krsna indicates in this chapter that bhakti-yoga, or devotional service to Him, is highest of all. It is the most direct, and it is the easiest means for association with the Godhead. In the Second Chapter the Lord explains that a living entity is not the material body but is a spiritual spark, a part of the Absolute Truth. In the Seventh Chapter He speaks of the living entity as part and parcel of the supreme whole and recommends that he transfer his attention fully to the whole. In the Eighth Chapter it is stated that whoever thinks of Krsna at the moment of death is at once transferred to the spiritual sky, Krsna’s abode. And at the end of the Sixth Chapter the Lord says that out of all theyogis, he who thinks of Krsna within himself is considered to be the most perfect. So throughout the Gita personal devotion to Krsna is recommended as the highest form of spiritual realization. Yet there are those who are still attracted to Krsna’s impersonal brahmajyotieffulgence, which is the all-pervasive aspect of the Absolute Truth and which is unmanifest and beyond the reach of the senses. Arjuna would like to know which of these two types of transcendentalists is more perfect in knowledge. In other words, he is clarifying his own position because he is attached to the personal form of Krsna. He is not attached to the impersonal Brahman. He wants to know whether his position is secure. The impersonal manifestation, either in this material world or in the spiritual world of the Supreme Lord, is a problem for meditation. Actually one cannot perfectly conceive of the impersonal feature of the Absolute Truth. Therefore Arjuna wants to say, “What is the use of such a waste of time?” Arjuna experienced in the Eleventh Chapter that to be attached to the personal form of Krsna is best because he could thus understand all other forms at the same time and there was no disturbance to his love for Krsna. This important question asked of Krsna by Arjuna will clarify the distinction between the impersonal and personal conceptions of the Absolute Truth. sri-bhagavan uvaca–the Supreme Personality of Godhead said;mayi–unto Me; avesya–fixing; manah–mind; ye–one who; mam–unto Me; nitya–always; yuktah–engaged; upasate–worships; sraddhaya–with faith; paraya–transcendental; upetah–engages; te–they; me–Me;yukta-tamah–most perfect; matah–I consider. The Blessed Lord said: He whose mind is fixed on My personal form, always engaged in worshiping Me with great and transcendental faith, is considered by Me to be most perfect. In answer to Arjuna’s question, Krsna clearly says that he who concentrates upon His personal form and who worships Him with faith and devotion is to be considered most perfect in yoga. For one in such Krsna consciousness there are no material activities because everything is done by Krsna. A pure devotee is constantly engaged. Sometimes he chants, sometimes he hears or reads books about Krsna, or sometimes he cooksprasadam or goes to the marketplace to purchase something for Krsna, or sometimes he washes the temple or the dishes–whatever he does, he does not let a single moment pass without devoting his activities to Krsna. Such action is in full samadhi. ye–those; tu–but; aksaram–which is beyond the perception of the senses; anirdesyam–indefinite; avyaktam–unmanifested; paryupasate–completely engages; sarvatra-gam–all-pervading; acintyam–inconceivable; ca–also; kuta-stham–in the center; acalam–immovable;dhruvam–fixed; sanniyamya–controlling; indriya-gramam–all the senses; sarvatra–everywhere; sama-buddhayah–equally disposed; te–they; prapnuvanti–achieve; mam–unto Me; eva–certainly; sarva-bhuta-hite–all living entities’ welfare; ratah–engaged. But those who fully worship the unmanifested, that which lies beyond the perception of the senses, the all-pervading, inconceivable, fixed and immovable–the impersonal conception of the Absolute Truth–by controlling the various senses and being equally disposed to everyone, such persons, engaged in the welfare of all, at last achieve Me. Those who do not directly worship the Supreme Godhead, Krsna, but who attempt to achieve the same goal by an indirect process, also ultimately achieve the supreme goal, Sri Krsna, as is stated, “After many births the man of wisdom seeks refuge in Me, knowing Vasudeva is all.” When a person comes to full knowledge after many births, he surrenders unto Lord Krsna. If one approaches the Godhead by the method mentioned in this verse, he has to control the senses, render service to everyone and engage in the welfare of all beings. It is inferred that one has to approach Lord Krsna, otherwise there is no perfect realization. Often there is much penance involved before one fully surrenders unto Him. In order to perceive the Supersoul within the individual soul, one has to cease the sensual activities of seeing, hearing, tasting, working, etc. Then one comes to understand that the Supreme Soul is present everywhere. Realizing this, one envies no living entity–he sees no difference between man and animal because he sees soul only, not the outer covering. But for the common man, this method of impersonal realization is very difficult. klesah–trouble; adhika-tarah–more troublesome; tesam–of them;avyakta–to unmanifested; asakta–being attached; cetasam–of those whose minds; avyakta–toward the unmanifested; hi–certainly; gatihduhkham–progress is troublesome; deha-vadbhih–of the embodiments;avapyate–achieve. For those whose minds are attached to the unmanifested, impersonal feature of the Supreme, advancement is very troublesome. To make progress in that discipline is always difficult for those who are embodied. The group of transcendentalists who follow the path of the inconceivable, unmanifested, impersonal feature of the Supreme Lord are called jnana-yogis, and persons who are in full Krsna consciousness, engaged in devotional service to the Lord, are called bhakti-yogis. Now, here the difference between jnana-yoga and bhakti-yoga is definitely expressed. The process of jnana-yoga, although ultimately bringing one to the same goal, is very troublesome, whereas the path of bhakti-yoga, the process of being in direct service to the Supreme Personality of Godhead, is easier and is natural for the embodied soul. The individual soul is embodied since time immemorial. It is very difficult for him to simply theoretically understand that he is not the body. Therefore, the bhakti-yogiaccepts the Deity of Krsna as worshipable because there is some bodily conception fixed in the mind, which can thus be applied. Of course, worship of the Supreme Personality of Godhead in His form within the temple is not idol worship. There is evidence in the Vedic literature that worship may be saguna and nirguna–of the Supreme possessing or not possessing attributes. Worship of the Deity in the temple is sagunaworship, for the Lord is represented by material qualities. But the form of the Lord, though represented by material qualities such as stone, wood or oil paint, is not actually material. That is the absolute nature of the Supreme Lord. A crude example may be given here. We may find some mailboxes on the street, and if we post our letters in those boxes, they will naturally go to their destination without difficulty. But any old box, or an imitation, which we may find somewhere, which is not authorized by the post office, will not do the work. Similarly, God has an authorized representation in the Deity form, which is called arca-vigraha. This arca-vigraha is an incarnation of the Supreme Lord. God will accept service through that form. The Lord is omnipotent and all-powerful; therefore, by His incarnation as arca-vigraha, He can accept the services of the devotee, just to make it convenient for the man in conditioned life. So, for a devotee, there is no difficulty in approaching the Supreme immediately and directly, but for those who are following the impersonal way to spiritual realization, the path is difficult. They have to understand the unmanifested representation of the Supreme through such Vedic literatures as the Upanisads, and they have to learn the language, understand the nonperceptual feelings, and they have to realize all these processes. This is not very easy for a common man. A person in Krsna consciousness, engaged in devotional service, simply by the guidance of the bona fide spiritual master, simply by offering regulative obeisances unto the Deity, simply by hearing the glories of the Lord, and simply by eating the remnants of foodstuffs offered to the Lord, realizes the Supreme Personality of Godhead very easily. There is no doubt that the impersonalists are unnecessarily taking a troublesome path with the risk of not realizing the Absolute Truth at the ultimate end. But the personalist, without any risk, trouble, or difficulty, approaches the Supreme Personality directly. A similar passage appears in Srimad-Bhagavatam. It is stated there that if one has to ultimately surrender unto the Supreme Personality of Godhead (this surrendering process is called bhakti), but instead takes the trouble to understand what is Brahman and what is not Brahman and spends his whole life in that way, the result is simply troublesome. Therefore it is advised here that one should not take up this troublesome path of self-realization because there is uncertainty in the ultimate result. A living entity is eternally an individual soul, and if he wants to merge into the spiritual whole, he may accomplish the realization of the eternal and knowledgeable aspects of his original nature, but the blissful portion is not realized. By the grace of some devotee, such a transcendentalist, highly learned in the process of jnana-yoga, may come to the point of bhakti-yoga, or devotional service. At that time, long practice in impersonalism also becomes a source of trouble, because he cannot give up the idea. Therefore an embodied soul is always in difficulty with the unmanifest, both at the time of practice and at the time of realization. Every living soul is partially independent, and one should know for certain that this unmanifested realization is against the nature of his spiritual blissful self. One should not take up this process. For every individual living entity the process of Krsna consciousness, which entails full engagement in devotional service, is the best way. If one wants to ignore this devotional service, there is the danger of turning to atheism. Thus this process of centering attention on the unmanifested, the inconceivable, which is beyond the approach of the senses, as already expressed in this verse, should never be encouraged at any time, especially in this age. It is not advised by Lord Krsna. 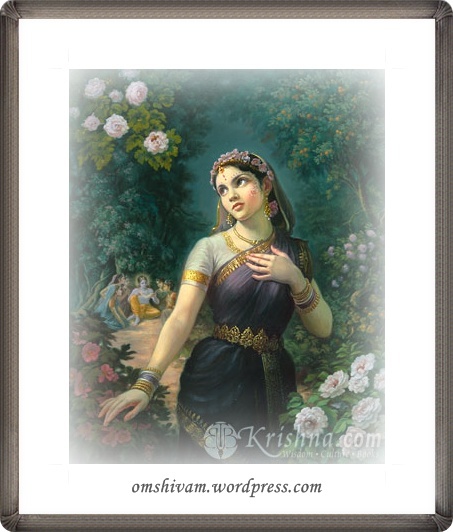 ye–one who; tu–but; sarvani–everything; karmani–activities;mayi–unto Me; sannyasya–giving up; mat-parah–being attached to Me; ananyena–without division; eva–certainly; yogena–by practice of such bhakti-yoga; mam–unto Me; dhyayantah–meditating; upasate–worship; tesam–of them; aham–I; samuddharta–deliverer; mrtyu–death; samsara–material existence; sagarat–from the ocean; bhavami–become; na cirat–not a long time; partha–O son of Prtha; mayi–unto Me; avesita–fixed; cetasam–of those whose minds are like that. For one who worships Me, giving up all his activities unto Me and being devoted to Me without deviation, engaged in devotional service and always meditating upon Me, who has fixed his mind upon Me, O son of Prtha, for him I am the swift deliverer from the ocean of birth and death. It is explicitly stated here that the devotees are very fortunate to be delivered very soon from material existence by the Lord. In pure devotional service one comes to the realization that God is great and that the individual soul is subordinate to Him. His duty is to render service to the Lord–if not, then he will render service to maya. As stated before, the Supreme Lord can only be appreciated by devotional service. Therefore, one should be fully devoted. One should fix his mind fully on Krsna in order to achieve Him. One should work only for Krsna. It does not matter in what kind of work one engages, but that work should be done only for Krsna. That is the standard of devotional service. The devotee does not desire any achievement other than pleasing the Supreme Personality of Godhead. His life’s mission is to please Krsna, and he can sacrifice everything for Krsna’s satisfaction, just as Arjuna did in the Battle of Kuruksetra. The process is very simple: one can devote himself in his occupation and engage at the same time in chanting Hare Krsna, Hare Krsna, Krsna Krsna, Hare Hare/ Hare Rama, Hare Rama, Rama Rama, Hare Hare. Such transcendental chanting attracts the devotee to the Personality of Godhead. The Supreme Lord herein promises that He will without delay deliver a pure devotee thus engaged from the ocean of material existence. Those who are advanced in yoga practice can willfully transfer the soul to whatever planet they like by the yoga process, and others take the opportunity in various ways, but as far as the devotee is concerned, it is clearly stated here that the Lord Himself takes him. He does not need to wait to become very experienced in order to transfer himself to the spiritual sky. The purport of this verse is that one should not engage in the different processes of fruitive activity or cultivate knowledge by the mental speculative process. One who is devoted to the Supreme Personality can attain all the benefits derived from other yogic processes, speculation, rituals, sacrifices, charities, etc. That is the specific benediction of devotional service. Simply by chanting the holy name of Krsna–Hare Krsna, Hare Krsna, Krsna Krsna, Hare Hare/ Hare Rama, Hare Rama, Rama Rama, Hare Hare–a devotee of the Lord can approach the supreme destination easily and happily, but this destination cannot be approached by any other process of religion. One should give up all other processes of self-realization and simply execute devotional service in Krsna consciousness. That will enable one to reach the highest perfection of life. There is no need for one to consider the sinful actions of his past life because the Supreme Lord fully takes charge of him. Therefore one should not futilely try to deliver himself in spiritual realization. Let everyone take shelter of the supreme omnipotent Godhead, Krsna. That is the highest perfection of life. mayi–unto Me; eva–certainly; manah–mind; adhatsva–fix; mayi–upon Me; buddhim–intelligence; nivesaya–apply; nivasisyasi–you live;mayi–unto Me; eva–certainly; atah urdhvam–thereafter; na–never;samsayah–doubt. One who is engaged in Lord Krsna’s devotional service lives in a direct relationship with the Supreme Lord, so there is no doubt that his position is transcendental from the very beginning. A devotee does not live on the material plane–he lives in Krsna. The holy name of the Lord and the Lord are nondifferent; therefore when a devotee chants Hare Krsna, Krsna and His internal potency are dancing on the tongue of the devotee. When he offers Krsna food, Krsna directly accepts these eatables, and the devotee becomes Krsna-ized by eating the remnants. One who does not engage in such service cannot understand how this is so, although this is a process recommended in the Gita and in other Vedic literatures. atha–if, therefore; cittam–mind; samadhatum–fixing; na–not;saknosi–able; mayi–upon Me; sthiram–fixed; abhyasa–practice;yogena–by devotional service; tatah–therefore; mam–Me; iccha–desire; aptum–to get; dhanam-jaya–O Arjuna. My dear Arjuna, O winner of wealth, if you cannot fix your mind upon Me without deviation, then follow the regulated principles of bhakti-yoga. In this way you will develop a desire to attain to Me. In this verse, two different processes of bhakti-yoga are indicated. The first applies to one who has actually developed an attachment for Krsna, the Supreme Personality of Godhead, by transcendental love. And the other is for one who has not developed an attachment for the Supreme Person by transcendental love. For this second class there are different prescribed rules and regulations one can follow to be ultimately elevated to the stage of attachment to Krsna. Bhakti-yoga is the purification of the senses. At the present moment in material existence the senses are always impure, being engaged in sense gratification. But, by the practice of bhakti-yoga these senses can become purified, and in the purified state they come directly in contact with the Supreme Lord. In this material existence, I may be engaged in some service to some master, but I don’t really lovingly serve my master. I simply serve to get some money. And the master also is not in love; he takes service from me and pays me. So there is no question of love. But for spiritual life, one must be elevated to the pure stage of love. That stage of love can be achieved by practice of devotional service, performed with the present senses. This love of God is now in a dormant state in everyone’s heart. And, there, love of God is manifested in different ways, but it is contaminated by the material association. Now the material association has to be purified, and that dormant, natural love for Krsna has to be revived. That is the whole process. To practice the regulative principles of bhakti-yoga one should, under the guidance of an expert spiritual master, follow certain principles: one should rise early in the morning, take bath, enter the temple and offer prayers and chant Hare Krsna, then collect flowers to offer to the Deity, cook foodstuffs to offer to the Deity, take prasadam, and so on. There are various rules and regulations which one should follow. And one should constantly hear Bhagavad-gita and Srimad-Bhagavatam from pure devotees. This practice can help anyone to rise to the level of love of God, and then he is sure of his progress into the spiritual kingdom of God. This practice of bhakti-yoga, under the rules and regulations, with the direction of a spiritual master, will surely bring one to the stage of love of God. abhyase–in practice of; api–even; asamarthah–unable; asi–you are; mat-karma–My work; paramah–supreme; bhava–you become;mat-artham–for My sake; api–even though; karmani–work; kurvan–performing; siddhim–perfection; avapsyasi–achieve. If you cannot practice the regulations of bhakti-yoga, then just try to work for Me, because by working for Me you will come to the perfect stage. One who is not able even to practice the regulative principles ofbhakti-yoga, under the guidance of a spiritual master, can still be drawn to this perfectional stage by working for the Supreme Lord. How to do this work has already been explained in the fifty-fifth verse of the Eleventh Chapter. One should be sympathetic to the propagation of Krsna consciousness. There are many devotees who are engaged in the propagation of Krsna consciousness, and they require help. So, even if one cannot directly practice the regulative principles of bhakti-yoga, he can try to help such work. Every endeavor requires land, capital, organization, and labor. Just as, in business, one requires a place to stay, some capital to use, some labor, and some organization to expand, so the same is required in the service of Krsna. The only difference is that in materialism one works for sense gratification. The same work, however, can be performed for the satisfaction of Krsna, and that is spiritual activity. If one has sufficient money, he can help in building an office or temple for propagating Krsna consciousness. Or he can help with publications. There are various fields of activity, and one should be interested in such activities. If one cannot sacrifice the results of such activities, the same person can still sacrifice some percentage to propagate Krsna consciousness. This voluntary service to the cause of Krsna consciousness will help one to rise to a higher state of love for God, whereupon one becomes perfect. atha–even though; etat–this; api–also; asaktah–unable; asi–you are; kartum–to perform; mat–unto Me; yogam–devotional service;asritah–refuge; sarva-karma–all activities; phala–result; tyagam–renunciation; tatah–therefore; kuru–do; yata-atma-van–self-situated. If, however, you are unable to work in this consciousness, then try to act giving up all results of your work and try to be self-situated. It may be that one is unable to even sympathize with the activities of Krsna consciousness because of social, familial or religious considerations or because of some other impediments. If one attaches himself directly to the activities of Krsna consciousness, there may be objections from family members, or so many other difficulties. For one who has such a problem, it is advised that he sacrifice the accumulated result of his activities to some good cause. Such procedures are described in the Vedic rules. There are many descriptions of sacrifices and special functions of pumundi, or special work in which the result of one’s previous action may be applied. Thus one may gradually become elevated to the state of knowledge. It is also found that when one who is not even interested in the activities of Krsna consciousness gives charity to some hospital or some other social institution, he gives up the hard-earned results of his activities. That is also recommended here because by the practice of giving up the fruits of one’s activities one is sure to purify his mind gradually, and in that purified stage of mind one becomes able to understand Krsna consciousness. Of course Krsna consciousness is not dependent on any other experience because Krsna consciousness itself can purify one’s mind, but if there are impediments to Krsna consciousness, one may try to give up the result of his action. In that respect, social service, community service, national service, sacrifice for one’s country, etc., may be accepted so that some day one may come to the stage of pure devotional service to the Supreme Lord. In Bhagavad-gita we find it is stated, yatah pravrttir bhutanam: if one decides to sacrifice for the supreme cause, even if he does not know that the supreme cause is Krsna, he will come gradually to understand that Krsna is the supreme cause by the sacrificial method. sreyah–better; hi–certainly; jnanam–knowledge; abhyasat–by practice; jnanat–better than knowledge; dhyanam–meditation;visisyate–especially considered; dhyanat–from meditation; karma-phala-tyagah–renunciation of the results of fruitive action; tyagat–by such renunciation; santih–peace; anantaram–thereafter. If you cannot take to this practice, then engage yourself in the cultivation of knowledge. Better than knowledge, however, is meditation, and better than meditation is renunciation of the fruits of action, for by such renunciation one can attain peace of mind. As mentioned in the previous verses, there are two kinds of devotional service: the way of regulative principles, and the way of full attachment in love to the Supreme Personality of Godhead. For those who are actually not able to follow the principles of Krsna consciousness, it is better to cultivate knowledge because by knowledge one can be able to understand his real position. Gradually knowledge will develop to the point of meditation. By meditation one can be able to understand the Supreme Personality of Godhead by a gradual process. There are processes which make one understand that one himself is the Supreme, and that sort of meditation is preferred if one is unable to engage in devotional service. If one is not able to meditate in such a way, then there are prescribed duties, as enjoined in the Vedic literature, for the brahmanas, vaisyas andsudras, which we shall find in a later chapter of Bhagavad-gita. But in all cases, one should give up the result or fruits of labor; this means to employ the result of karma for some good cause. In summary, to reach the Supreme Personality of Godhead, the highest goal, there are two processes: one process is by gradual development, and the other process is direct. Devotional service in Krsna consciousness is the direct method, and the other method involves renouncing the fruits of one’s activities. Then one can come to the stage of knowledge, then to the stage of meditation, then to the stage of understanding the Supersoul, and then to the stage of the Supreme Personality of Godhead. One may either take the step by step process or the direct path. The direct process is not possible for everyone; therefore the indirect process is also good. It is, however, to be understood that the indirect process is not recommended for Arjuna because he is already at the stage of loving devotional service to the Supreme Lord. It is for others who are not at this stage; for them the gradual process of renunciation, knowledge, meditation and realization of the Supersoul and Brahman should be followed. But as far as Bhagavad-gita is concerned, it is the direct method that is stressed. Everyone is advised to take to the direct method and surrender unto the Supreme Personality of Godhead, Krsna. advesta–nonenvious; sarva-bhutanam–for all living entities;maitrah–friendly; karunah–kindly; eva–certainly; ca–also; nirmamah–with no sense of proprietorship; nirahankarah–without false ego; sama–equally; duhkha–distress; sukhah–happiness; ksami–forgiving;santustah–satisfied; satatam–always; yogi–engaged in devotion; yata-atma–self-controlled; drdha-niscayah–with determination; mayi–upon Me; arpita–engaged; manah–mind; buddhih–intelligence; yah–one who; mat-bhaktah–My devotee; sah me priyah–he is dear to Me. One who is not envious but who is a kind friend to all living entities, who does not think himself a proprietor, who is free from false ego and equal both in happiness and distress, who is always satisfied and engaged in devotional service with determination and whose mind and intelligence are in agreement with Me–he is very dear to Me. Coming again to the point of pure devotional service, the Lord is describing the transcendental qualifications of a pure devotee in these two verses. A pure devotee is never disturbed in any circumstances. Nor is he envious of anyone. Nor does a devotee become his enemy’s enemy; he thinks that one is acting as his enemy due to his own past misdeeds. Thus it is better to suffer than to protest. In the Srimad-Bhagavatam it is stated:tat te ‘nukampam susamiksamano. Whenever a devotee is in distress or has fallen into difficulty, he thinks that it is the Lord’s mercy upon him. He thinks: “Thanks to my past misdeeds I should suffer far, far greater than I am suffering now. So it is by the mercy of the Supreme Lord that I am not getting all the punishment I am due. I am just getting a little, by the mercy of the Supreme Personality of Godhead.” Therefore he is always calm, quiet and patient, despite many distressful conditions. A devotee is always kind to everyone, even to his enemy. Nirmama means that a devotee does not attach much importance to the peace and trouble pertaining to the body because he knows perfectly well that he is not the material body. He does not identify with the body; therefore he is freed from the conception of false ego and is equipoised both in happiness and distress. He is tolerant, and he is satisfied with whatever comes by the grace of the Supreme Lord. He does not endeavor much to achieve something with great difficulty; therefore he is always joyful. He is a completely perfect mystic because he is fixed in the instructions received from the spiritual master, and because his senses are controlled, he is determined. He is not swayed by false argument because no one can lead him from the fixed determination of devotional service. He is fully conscious that Krsna is the eternal Lord, so no one can disturb him. All his qualifications enable him to depend entirely on the Supreme Lord. Such a standard of devotional service is undoubtedly very rare, but a devotee becomes situated in that stage by following the regulative principles of devotional service. Furthermore, the Lord says that such a devotee is very dear to Him, for the Lord is always pleased with all his activities in full Krsna consciousness. yasmat–from whom; na–never; udvijate–agitates; lokah–persons;lokat–persons; na–never; udvijate–disturbed; ca–also; yah–anyone;harsa–happiness; amarsa–distress; bhaya–fear; udvegaih–with anxiety; muktah–freed; yah–who; sah–anyone; ca–also; me–Mine;priyah–very dear. He for whom no one is put into difficulty and who is not disturbed by anxiety, who is steady in happiness and distress, is very dear to Me. A few of a devotee’s qualifications are further being described. No one is put into difficulty, anxiety, fearfulness, or dissatisfaction by such a devotee. Since a devotee is kind to everyone, he does not act in such a way to put others into anxiety. At the same time, if others try to put a devotee into anxiety, he is not disturbed. It is by the grace of the Lord that he is so practiced that he is not disturbed by any outward disturbance. Actually because a devotee is always engrossed in Krsna consciousness and engaged in devotional service, all such material circumstances cannot woo him. Generally a materialistic person becomes very happy when there is something for his sense gratification and his body, but when he sees that others have something for their sense gratification and he hasn’t, he is sorry and envious. When he is expecting some retaliation from an enemy, he is in a state of fear, and when he cannot successfully execute something he becomes dejected. But a devotee is always transcendental to all these disturbances; therefore he is very dear to Krsna. anapeksah–neutral; sucih–pure; daksah–expert; udasinah–free from care; gata-vyathah–freed from all distress; sarva-arambha–all endeavors; parityagi–renouncer; yah–anyone; mat-bhaktah–My devotee; sah–he; me–Me; priyah–very dear. A devotee who is not dependent on the ordinary course of activities, who is pure, expert, without cares, free from all pains, and who does not strive for some result, is very dear to Me. Money may be offered to a devotee, but he should not struggle to acquire it. If automatically, by the grace of the Supreme, money comes to him, he is not agitated. Naturally a devotee takes bath at least twice in a day and rises early in the morning for devotional service. Thus he is naturally clean both inwardly and outwardly. A devotee is always expert because he fully knows the essence of all activities of life, and he is convinced of the authoritative scriptures. A devotee never takes the part of a particular party; therefore he is carefree. He is never pained because he is free from all designations; he knows that his body is a designation, so if there are some bodily pains, he is free. The pure devotee does not endeavor for anything which is against the principles of devotional service. For example, constructing a big building requires great energy, and a devotee does not take to such business if it does not benefit him by advancing his devotional service. He may construct a temple for the Lord, and for that he may take all kinds of anxiety, but he does not construct a big house for his personal relations. yah–one who; na–never; hrsyati–takes pleasure; na–never; dvesti–grieves; na–never; socati–laments; na–never; kanksati–desires;subha–auspicious; asubha–inauspicious; parityagi–renouncer; bhakti-man–devotee; yah–one who; sah–he is; me–Mine; priyah–dear. One who neither grasps pleasure or grief, who neither laments nor desires, and who renounces both auspicious and inauspicious things, is very dear to Me. A pure devotee is neither happy nor distressed over material gain and loss, nor is he very much anxious to get a son or disciple, nor is he distressed by not getting them. If he loses anything which is very dear to him, he does not lament. Similarly, if he does not get what he desires, he is not distressed. He is transcendental in the face of all kinds of auspicious, inauspicious and sinful activities. He is prepared to accept all kinds of risks for the satisfaction of the Supreme Lord. Nothing is an impediment in the discharge of his devotional service. Such a devotee is very dear to Krsna. samah–equal; satrau–to the enemy; ca–also; mitre–to friends; ca–also; tatha–so; mana–honor; apamanayoh–dishonor; sita–cold;usna–heat; sukha–happiness; duhkhesu–distress; samah–equipoised;sanga-vivarjitah–free from all association; tulya–equal; ninda–defamation; stutih–repute; mauni–silent; santustah–satisfied; yena–somehow; kena–or other; cit–if; aniketah–having no residence; sthira–fixed; matih–determination; bhakti-man–engaged in devotion; me–My; priyah–dear; narah–a man. One who is equal to friends and enemies, who is equipoised in honor and dishonor, heat and cold, happiness and distress, fame and infamy, who is always free from contamination, always silent and satisfied with anything, who doesn’t care for any residence, who is fixed in knowledge and engaged in devotional service, is very dear to Me. A devotee is always free from all bad association. Sometimes one is praised and sometimes one is defamed; that is the nature of human society. But a devotee is always transcendental to artificial fame and infamy, distress or happiness. He is very patient. He does not speak of anything but the topics about Krsna; therefore he is called silent. Silent does not mean that one should not speak; silent means that one should not speak nonsense. One should speak only of essentials, and the most essential speech for the devotee is to speak of the Supreme Lord. He is happy in all conditions; sometimes he may get very palatable foodstuffs, sometimes not, but he is satisfied. Nor does he care for any residential facility. He may sometimes live underneath a tree, and he may sometimes live in a very palatial building; he is attracted to neither. He is called fixed because he is fixed in his determination and knowledge. We may find some repetition in the descriptions of the qualifications of a devotee, but this is just to give an illustration of the fact that a devotee must acquire all these qualifications. Without good qualifications, one cannot be a pure devotee. O ne who is not a devotee has no good qualification. One who wants to be recognized as a devotee should develop the good qualifications. Of course he does not extraneously endeavor to acquire these qualifications, but engagement in Krsna consciousness and devotional service automatically help him develop them. ye–one who; tu–but; dharma–of religion; amrtam–nectar; idam–this; yatha–as; uktam–said; paryupasate–completely engage;sraddadhanah–with faith; mat-paramah–taking the Supreme Lord as everything; bhaktah–devotees; te–such persons; ativa–very, very; me–Me; priyah–dear. He who follows this imperishable path of devotional service and who completely engages himself with faith, making Me the supreme goal, is very, very dear to Me. In this chapter the religion of eternal engagement, the explanation of the processes of transcendental service for approaching the Supreme Lord, is given. This process is very dear to the Lord, and He accepts a person who is engaged in such a process. The question who is better–one who is engaged in the path of impersonal Brahman or one who is engaged in the personal service of the Supreme Personality of Godhead–was raised by Arjuna, and the Lord replied to him so explicitly that there is no doubt that devotional service to the Personality of Godhead is the best of all processes of spiritual realization. In other words, in this chapter it is decided that through good association, one develops attachment for pure devotional service and thereby accepts a bona fide spiritual master and from him begins to hear and chant and observe the regulative principles of devotional service with faith, attachment and devotion and thus becomes engaged in the transcendental service of the Lord. This path is recommended in this chapter; therefore there is no doubt that devotional service is the only absolute path for self-realization, for the attainment of the Supreme Personality of Godhead. The impersonal conception of the Supreme Absolute Truth, as described in this chapter, is recommended only up to the time one surrenders himself for self-realization. In other words, as long as one does not have the chance to associate with a pure devotee, the impersonal conception may be beneficial. In the impersonal conception of the Absolute Truth one works without fruitive result, meditates and cultivates knowledge to understand spirit and matter. This is necessary as long as one is not in the association of a pure devotee. Fortunately, if one develops directly a desire to engage in Krsna consciousness in pure devotional service, he does not need to undergo step by step improvements in spiritual realization. 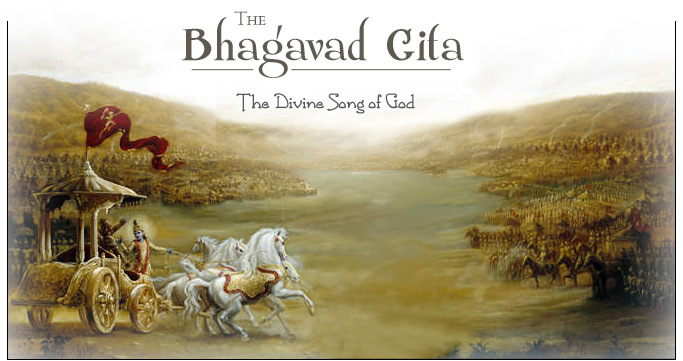 Devotional service, as described in the middle six chapters of the Bhagavad-gita, is more congenial. One need not bother about materials to keep body and soul together because by the grace of the Lord everything is carried out automatically. Thus end the Bhaktivedanta Purports to the Twelfth Chapter of theSrimad Bhagavad-gita in the matter of Devotional Service.